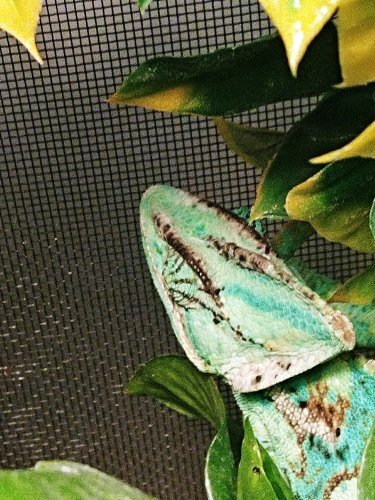 Your Chameleon - veiled male little over a year old. He's slowed down his activity A LOT since winter came. I'm not sure if that's normal. He started going to sleep at earlier and earlier times. He's slowly started refusing crickets so I've been brining in meal worms, hornworms and roaches. He sleeps a lot during the day, yesterday he slept through the whole day. Today he woke up at 7am and went back to sleep at noon. He ate a 2 inch fat horn worm 2 days ago. I've tried offering him roaches but he will only open his eyes for a few seconds, or he'll try to stick em and knock them out of my hand once and completely give up on trying to eat them and go back to sleep. I haven't seen him drink in a while so I keep the cage well misted. I'm getting my tax returns soon so I'll take him to the get. How often do you use the vitamin with d3? So if he is sleeping during the day this is not a good thing. With his lighting is the UVB a compact bulb? IF it is this is a big issue and can lead to MBD. Your basking heat is too low. His basking should be between 90-95 degrees. You need to know what your humidity levels are. You can get an hydrometer. With the supplements what exactly are you using every other day? What is your schedule for giving D3? Don't feed mealworms they can cause him to be impacted. Depending on the specific brand of UBV bulb (not just whether it's a CFL or not) his lighting may not be great. Linear (tube) type UVBs tend to be much more beneficial. CFL bulbs can produce UVB but not all brands produce the correct amount. CFLs can also irritate their eyes. He should be getting calcium without D3 every day. Calcium with D3 once every other week. Multivitamin once every other week. What you feed your insects also matters. If you don't feed them correctly they won't provide good nutrition to your cham, compounding the trouble. Your gutloading could use improvement! As already mentioned, you need to know the cage humidity. Chances are it is too low. When chams get chronically dehydrated they tend to stop eating. Not only is it harder for them to digest food when dehydrated, their eyes get irritated (so they keep them shut) and they can get seriously constipated and the mucus glands on their tongue don't function well. This means they can't even catch the food they shoot at, so they eventually stop trying. 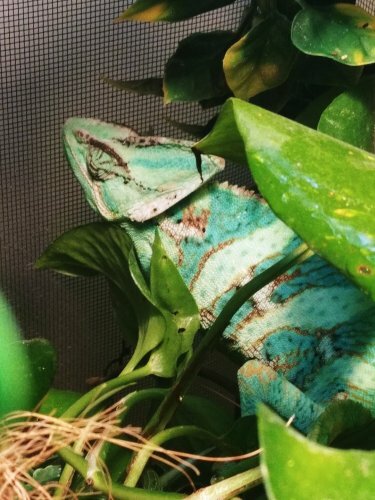 Your cham looks dehydrated based on your pics. Unless you get your tax return in the next day or so you can't wait to fix this. He's in trouble now. By the time a cham shows signs of not being well its serious. They tend to hide signs of weakness until they simply can't any longer. The fixes have more to do with your setup and your husbandry than something a vet can do. Read the veiled husbandry articles located under the Resources tab above. Fix the husbandry problems or you'll lose him. Vd3 twice a month. What happens if it's fed too often? 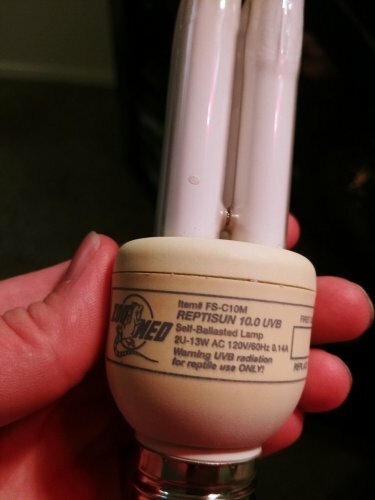 Look at the information printed on the BULB! That's what you need to know. Do you have the package it came in? Chances are a lot of your problems are due to this bulb. Get rid of it. This also means the fixture you are using isn't correct. 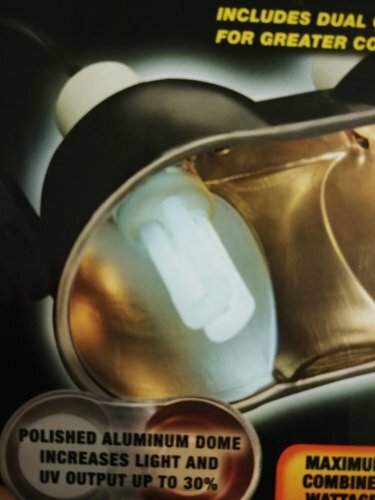 The UV producing bulbs hobbyists tend to like best are those made by Arcadia. If you can't get one quickly through ordering, you can hopefully find a Reptisun 5.0 linear tube bulb at a local pet supply. You will need a different fixture to use a linear bulb. You need to fix your humidity/watering problems. That is probably the most urgent. Get a digital humidity gauge (not the cheapo analog gauges at a local pet shop...check a home improvement store for a room humidity gauge instead), add live plants to the cage, mist a lot more often, and get water into this guy. 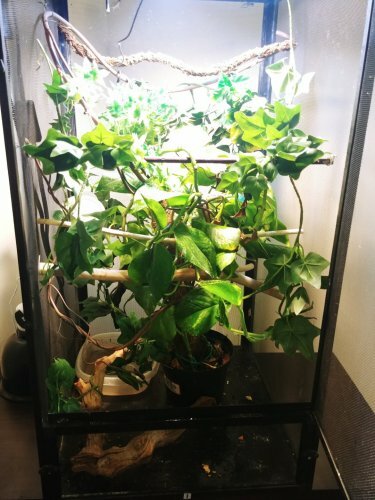 There are lots of suggestions at the top of the Caging and Supplies subforum and under the Resources tab about how to increase humidity and keep chams hydrated better. If you overdose the calcium with D3 it will cause metabolic problems. Vitamin D3 is fat soluable...meaning it tends to build up in tissue over time. A cham needs less of it. Standard use should be dusting once every two weeks. Use the calcium without D3 daily. That bulb is too intense! No wonder he's keeping his eyes closed. Bulb switched to 5.0. Hydro meter currently at 45%. I've been letting him climb a brand in the showers mist. He's eaten the roaches I touch to his jaw. Opening eyes more. Did you switch to a T5 or T8 fixture with the 5.0 linear UVB bulb or get another compact bulb?